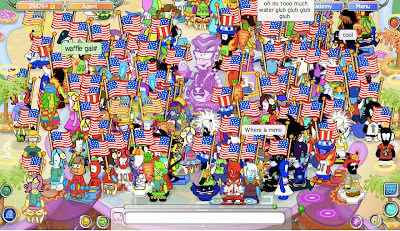 If you want to vote, go to the Club Penguin Blog. This new play should be pretty cool. What do you think the play will be about? (besides gnomes, lol) I think the middle gnome looks the most, realistic, but not sure which one I am going to vote for yet. How 'bout you? Do you know which one you are voting for? I think the name of the play should be "I'LL BE GNOME FOR CHRISTMAS." ;-] Do you agree? Mimo Party Clue #2! Yeah There's Gonna Be A Party! So we're on to clue number 2. You got the first one didn't you? It's time to party Club Penguin style. It's time to party Mimo style. So what is the clue? You want to know? It's a list places you should want to go. That's it. Figure it out. Go! Like to make music? Play Franktown Rocks! Club Penguin Dojo Almost Complete and Halloween Costumes! If you log on the Club Penguin you will notice the sky is no longer orange. Saweet! 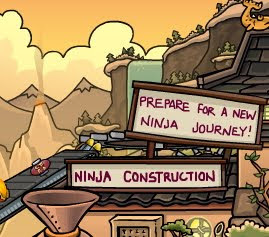 I cant wait until everything is revealed in the Dojo. How about you? Has Mimo gone crazy? Has Mimo gone mad? Why are toasters lazy? Why are apples glad? Do you want a cp party? Do you want to dance? Do you know a barber named Stevie Allan Vance? So Mimo what's your story and what's with the pic? And why can't my dentist do a magic trick? So many questions. But I can only say so much. Now I must go and fix my broken iPod Touch! CHOBOTS WAS HAVING PROBLEMS. SORRY ABOUT THAT. It was still fun! 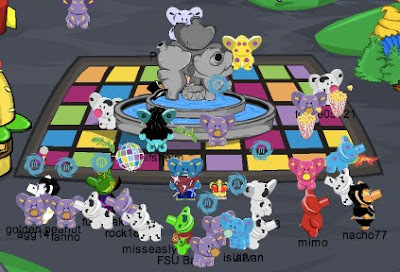 I will be having a Mimo Chobots Rain Party tomorrow on Mimo Games. What's a Rain Party? Click here. This Sunday, September 27 TOMORROW! I'm hoping for a Mimo Flag to rain but not sure if that will happen. Lots of free items given away! Click here if you want details on the party. If you like Tootsville leave a comment and let me know and maybe we can do it again! Step 2. Now go upstairs into the book room. Step 3. Now click on the Padlock Pin on the bookshelf! NOW YOU HAVE THE NEWEST CLUB PENGUIN PIN, PADLOCK PIN! Whoa! I got the pin too early again! It says undefined! Swoot! Don't forget about the BIG Mimo Party this weekend. Click here! Don't forget the BIG Mimo Party THIS WEEKEND! CLICK HERE! 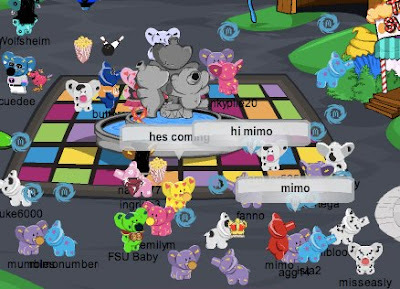 Ready for a Mimo Party on a New Game!? TOOTSVILLE! 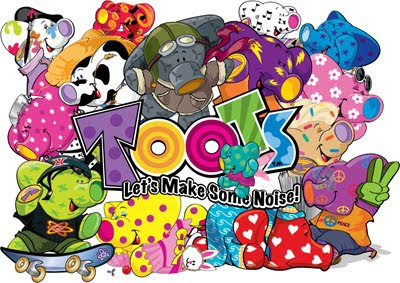 Toots® are a Tooterific herd of elephants, each with a distinct look and personality. The Toots® were magically transformed when they discovered the very first wishing well. Over the years they have wished some pretty amazing things into existence. Now they would like kids from around the world to discover the wonders that exist in Tootsville.com. So raise your trunks and make some noise! Tootsville has some of the better games I seen! 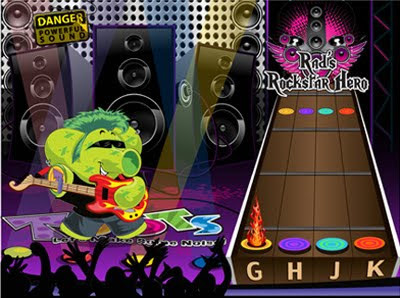 They have a Guitar Hero type game... I love this game! Try it! 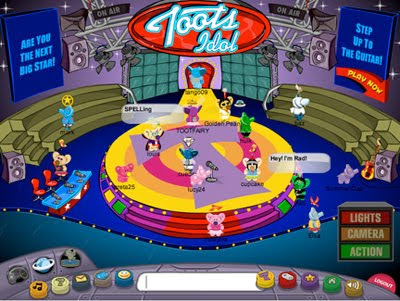 And an American Idol type game... You know how much I love American Idol! Check out China with Mimo's Toot he got in the mail! Click the button above to register now! Get a good username! Toots memberships are free, but there is also a VIT membership that gives you full access to all the amazing things there are to do and see in Tootsville.com. ANYONE attending my party will also get a special prize! The first 100 Mimo guests that sign up for a VIT membership will get a free Toot plush sent to them, Like I did! 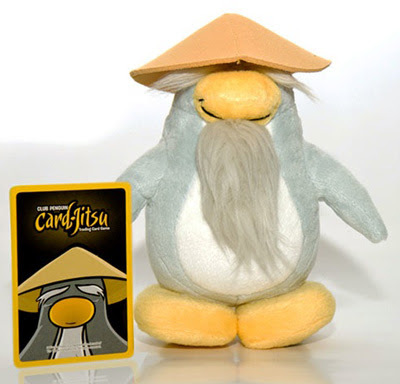 "Wow, I love all of the Card-Jitsu cards, it's so hard to choose a favorite! If I had to pick, I'd go with the Keeper of the Boiler Room card! It's so funny to use it during a match and watch our opponent fall down the speaker! 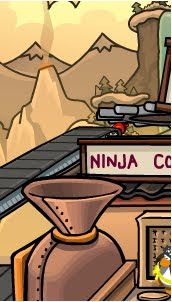 It's also cute to see the little green puffle become part of the action! I love it so much! Waddle on!" Great review, Hnwjanuary11! Congrats on the 10,000 new coins for getting yours on the Club Penguin Blog! Woot! Club Penguin is looking forward to the Halloween Party so, for next week, Club Penguin wants to know what Club Penguin Halloween costume has stuck in your mind as the ultimate? I personally think ghost costume is pretty cool since it glows when you have a flashlight. Which costume do you like best? Where we'll seek to train. Before we learn its secrets. Oh yeah, Club Penguin has changed the date for the new Igloo music. It should be here tomorrow. Also, make sure to check here for the new Pin cheat. If you go to the Dojo, you can see the volcano beginning to erupt! 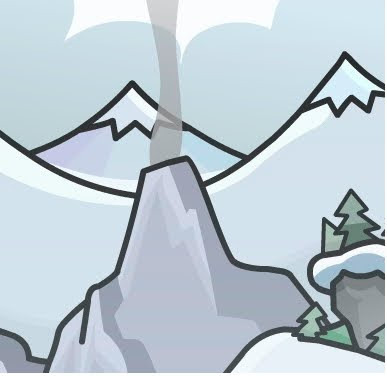 Also, Club Penguin has extended the Sensei Scavenger Hunt until Sept. 28th! Keep your eyes open for more clues. I will let you know as soon as more are discovered! 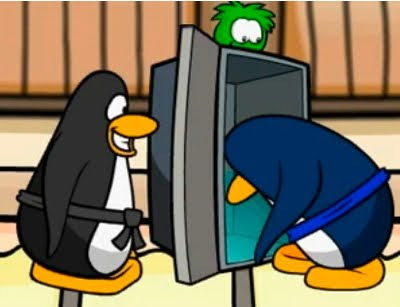 I found this out BEFORE Club Penguin posted it! Cool, huh?